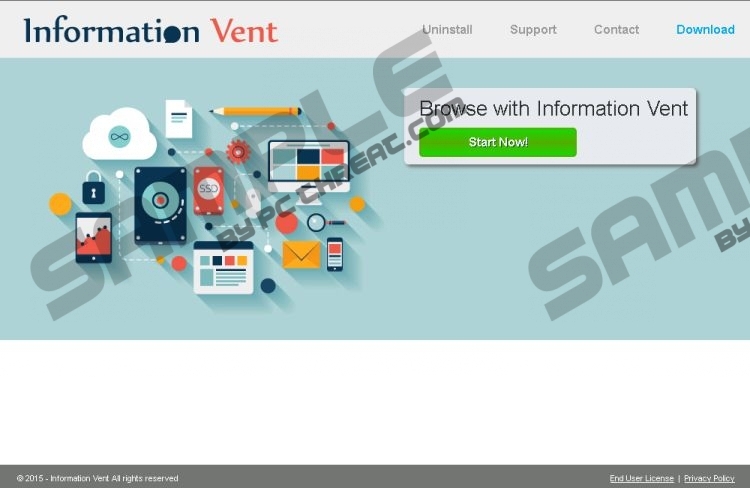 Information Vent is one more adware application that comes from the SuperWeb LLC group, which is infamous for developing other adware programs such as Box for You, Any Angle, Bold Letters, and many others. Therefore, it is quite natural that you are advised to remove Information Vent just like any of its counterparts. In most cases, users get their system infected due to devious marketing strategies employed by the developers of Information Vent. Generally, this adware application is advertised as a tool that should be used if you wish to save time or money while you are shopping online. Unfortunately, these promises are a hoax since all that this adware program can do is cause major disturbances every single time you decide to browse the web. To regain the standard functionality of your web browser you will need to remove Information Vent completely from your PC; otherwise the annoying activity will continue to bother you. Since Information Vent does not provide a working download link on its official website it is safe to assume that it is distributed in some other dubious way. During the research, we have discovered that in most cases this intrusive adware application is spared via bundled installers. This is not surprising because it is known that such a way of distribution is very common among adware applications. In order to reduce the risk of getting your PC infected in this way make sure to avoid third-party download websites since they are the primary source of installers filled with unwanted programs. Additionally we advise you to learn about the application you wish to have as much as possible before installing it because it could be marketed in a hoax way just like Information Vent. Your best bet to keep your PC safe and secure at all times is to install a professional antimalware tool, which would provide overall system security at all times. Almost every application that is developed by the SuperWeb LLC group functions alike. Once Information Vent gains access to your operating system, it will almost instantly flood your web browser with unwanted third-party content. Most of such content manifests as banned ads and annoying pop-ups. It goes without saying that such activity promoted by this invasive adware will make your online experience a frustrating and annoying one. You will be forced to fight through those annoying ads and pop-ups every single time you decide to browse the web. Unfortunately, no ad will be helpful since it will not provide any good discount deals or great coupons. It is quite ironic that an application that should improve your online experience will only do the opposite of it. As long as Information Vent is active on your PC the intrusive activity will bother you; the only way that you can stop it is by conducting a complete removal of this invasive adware application. The removal of Information Vent should not be delayed since it has been found out that other Internet-based infection could use it as a backdoor into your operating system. Even though, this is not an often instance, it remains a highly dangerous one. Do not take any chances with as the outcomes of running it on your PC could be devastating. Use the removal guide immediately and delete this adware from your computer once and for all. Select the undesirable program and click the Uninstall button. Quick & tested solution for Information Vent removal.